In a few days, more than 3,000 people, committed to tackling the challenges of sustainable land use in a time of climate change, will come together in Paris for the 2015 Global Landscapes Forum. As in the past, I will join the inspiring debate on fire and haze, food security and climate change, sustainable landscapes and migration, and land restoration. Take a look at the agenda and find out how you can follow the event via web streaming. 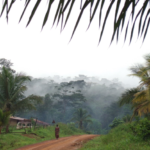 Fittingly, this newsletter is dedicated to the CGIAR Research Program on Forests, Trees and Agroforestry (FTA) Flagship 3: Landscape management for environmental services, biodiversity conservation and livelihoods. Read all stories from the six FTA centers below. See you in Paris on 5–6 December! Meine van Noordwijk coordinates the landscape theme under the CGIAR FTA. He works with the landscape approach to reconcile the interests of diverse stakeholders. High on his research agenda is finding ways to protect biodiversity and ecosystem services while lifting people out of poverty and into food and livelihood security. Read his blog here. The values of tropical production forests are important and should not be written off, says CIRAD scientist Plinio Sist. Covering 400 million hectares, they maintain high carbon stocks and high biodiversity. In an interview, Sist explains his ideas of how to better value these forests and make their management sustainable. He will also speak to his ideas at the discussion forum Managing and restoring natural tropical forests: Ensuring a sustainable flow of benefits for people in the context of global change at the 2015 Global Landscapes Forum this coming weekend. Healthy landscapes require policies that promote climate-smart agricultural practices, especially among smallholders. But, so far, food security is not very high on the climate change agenda. 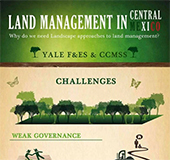 Now, CATIE and AIRCA have partnered for a discussion forum at the 2015 Global Landscapes Forum. CATIE’s Bastiaan Loumann explains why he thinks the GLF can help spread the word among key players. In a short project presentation, CIFOR scientists lay out what they have learned about the benefits of the integrated landscape approach to REDD+ and other land stewardship strategies. The project is the product of a partnership with four countries: Indonesia, Mexico, Peru and Vietnam. Each has introduced climate change mitigation and adaptation strategies, including ongoing REDD+ projects. Experience from Uganda shows that benefits flow to villages and districts when they regulate forest management and restoration. The Kapchorwa District Landcare Chapter, for instance, has succeeded in establishing community by-laws that aim to manage grazing, tree clearing, and conflicts with protected areas; demonstrably improving forest health on community land. Land restoration is a key strategy for sustainable development and managing climate change. Restoration efforts must, however, ensure genetic diversity to be successful, writes Bioversity’s Ann Tutweiler. Bioversity is committed to the 20×20 initiative in Latin America, together with FTA partners ICRAF, CIAT and CATIE. The Global Landscapes Forum, 5–6 December in Paris, will see a first assessment of 20×20, one year after its launch at GLF 2014. Under the FTA Smart-Tree-Invest project, leading farmers and technicians in the Philippines are trained in sustainable agroforestry, helping them adapt to climate change. Local communities are to devise climate-smart practices in collaboration with local government and the private sector. Climate-smart agriculture and agroforestry for landscape restoration are key themes at the upcoming Global Landscapes Forum 2015. At the World Forestry Congress in Durban, CIFOR’s Terry Sunderland talked about the landscape approach. He sees too much confusion over jargon and terminology which, he says, keeps practitioners from taking up landscape approaches. Now, at the Global Landscapes Forum 2015 in Paris, we pick up the conversation with a focus on water management and landscapes. In Cameroon, the Ministry of Forestry and Wildlife has created geographical areas for competing land use, called ‘Technical Operation Units’. A CIFOR scientist thinks these units can be the basis for a landscape approach to development. Key to the approach is a conversation between all stakeholders, to start to manage trade-offs and reconcile competing needs. This spirit is also the foundation of the Global Landscapes Forum 2015 – the biggest side-event of COP21 in Paris. For researchers in Indonesia, it pays to spend time in Sumatra’s coffee shops if they want to start to understand local knowledge. Hydrologists working on the predicting ungauged basins (PUB) program have discovered that PUB research yields less information about landscape function than traditional coffee house talk. Find out what other ideas ICRAF researchers came up with at a recent meeting in Bogor, Indonesia. Restoring forests: What constitutes success in the twenty-first century? 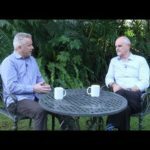 Andrew Wardell, CIFOR – Keynote address: Governance challenges in sustainable landscapes.